If you have diabetes, you are twice as likely to have a heart attack or stroke than someone who does not, according to the American Diabetes Association. Eating right not only helps you manage your blood sugar but also helps lower cholesterol and blood pressure. A cardiac and diabetic diet encourages you to eat more fresh, whole foods and less saturated fat and sodium. Consult a doctor before making any dietary changes. A cardiac and diabetic meal plan incorporates the diet basics for both diabetes and heart health. That means continuing to control your carb intake by eating the same amount of carbs at each meal as determined by your dietitian or doctor to manage blood sugar. If you don't know your meal carb needs, the ADA suggests starting at 45 to 60 grams. In addition, to improve heart health, eat more nutrient-rich foods such as fruits, vegetables, whole grains, low-fat dairy, poultry, fish and nuts, while limiting foods high in calories and sodium that offer very little nutrition, such as soda, cake and fast food. Limit sodium to less than 2,300 milligrams a day, or 1,500 milligrams if you have high blood pressure. Make whole grains a priority at breakfast. Whole grains, as well as fruits and vegetables, are a good source of fiber, and getting more fiber in your diet helps with blood sugar control and lowers your risk of heart disease. A heart-healthy diabetic breakfast might include 1/2 cup of cooked oatmeal topped with a small banana and served with a 6-ounce container of sugar-free yogurt. Or try a toasted whole-wheat English muffin topped with 2 teaspoons of peanut butter and an apple. The American Heart Association recommends you eat at least two servings of fish a week. The omega-3 fatty acids found in fatty fish such as salmon and tuna improve heart health. 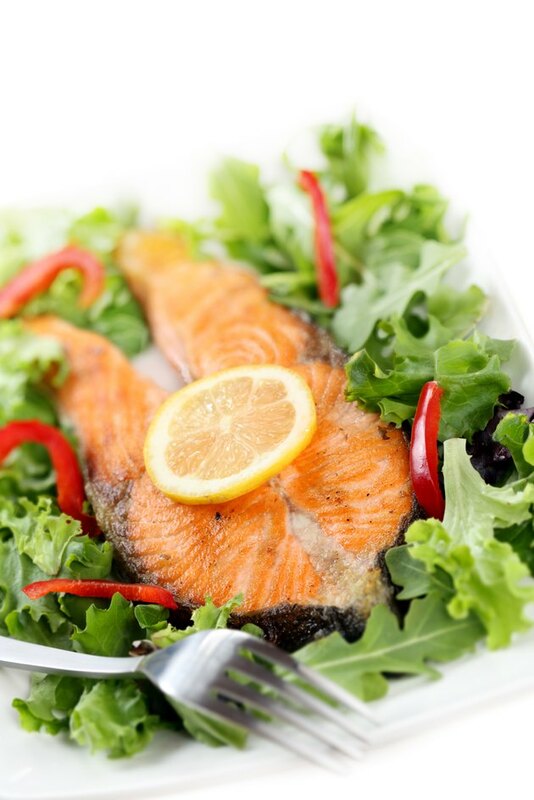 A lunch rich in omega-3s that helps you manage blood sugar might include grilled salmon served with steamed broccoli, a 6-ounce baked potato and a small orange. Another heart-healthy, carb-controlled lunch meal might include 1 cup of whole-wheat pasta tossed with plain tuna, mixed nonstarchy vegetables such as green beans, carrots and cauliflower and low-fat salad dressing. Keep your saturated fat intake down by eating lean sources of protein such as beans, soy foods, poultry and fish. For dinner, you might enjoy a meatless meal consisting of a 6-inch whole-wheat tortilla filled with 1/2 cup of beans, lettuce, tomato, onions and low-fat cheese and served with 1/3 cup of brown rice and salsa. Or, have baked chicken with 1 cup of peas, one slice of whole-wheat bread and a tossed salad with low-fat salad dressing. American Diabetes Association: Diabetes and Heart Health -- What's the Connection?